A highway sign warns drivers of slippery conditions along I-95 southbound in Stratford, Conn., in this file photo. 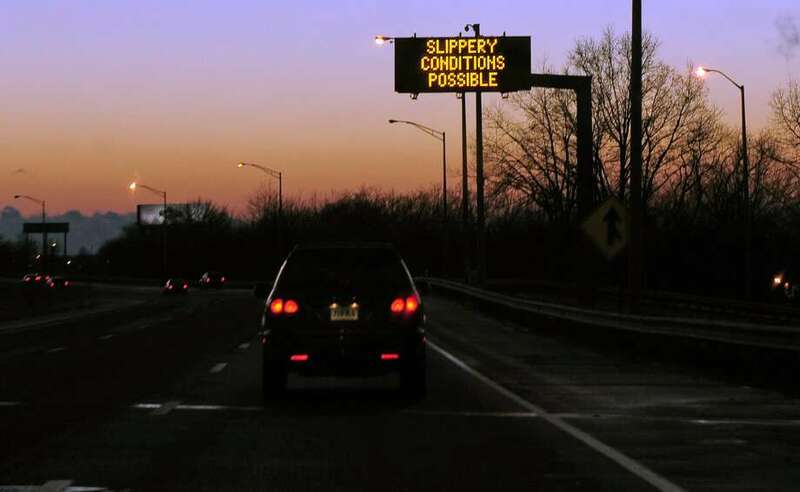 Drivers could see slippery conditions during the Friday morning commute, as light snows are expected to continue in Connecticut through the afternoon. As of 6:30 a.m., the state’s highways are operating normally and at full speed, according to the Connecticut Department of Transportation, but that could change. Despite expected snow accumulations around one inch or less through most of the state, the National Weather Service is still warning drivers to be wary. “Motorists should be prepared for the possibility of slippery roads and use caution while driving,” said the National Weather Service in a special weather statement early Friday morning. All snow should be finished falling by noon, the NWS said. Hamden and Stamford are the only towns, as of 7 a.m., with major school delays due to the storm. All Hamden and Stamford Public Schools will have a two-hour delay Friday. To stay up to date on school closings and delays, WTNH-8 has a list updated throughout the day. Friday’s flurries are the first part of what is expected to be a two-part storm. Though Friday’s preview was minimal, the second half of the system, which is expected to land Saturday afternoon, could be the first major snow storm of the year.